« If You Trade with a Plan, Are You a “Discretionary” Trader? Have you ever looked back at the end of a trading day and thought “Why in the world did I do that?” Everything seems so obvious at the end of the day, but, of course, traders have to make decisions without the benefit of hindsight. It can be quite helpful to “replay” the day to figure out why you made certain decisions at certain times to determine whether you made mistakes. Taking an honest look at yourself can help you discover ways to improve your trading. Many traders are too quick to sulk about their losses instead of using them for what they are: extremely valuable opportunities for future trading success. There are several ways to record your trading session for future review. It is possible to use a video recording application (such as Camtasia Studio) to capture the tick by tick action of your trading. While this approach would be able to record every possible data point, the videos would result in very large files that would require too much space to store them. A far more practical strategy is to take screenshots of your trading platform at regular intervals. There are a few software packages that can be setup to do this automatically without lifting a finger. What you’ll end up with is several image files (in the folder of your choosing) on your computer. You might be surprised to learn that there is a free software package that can do almost everything you need from automatically taking the screenshots of your desktop to replaying them. It is called IrfanView and it’s available as a free download for Windows. Once you’ve installed it, just start IrfanView from the windows start menu. From the Options menu, choose Capture/Screenshot. Here’s the screen that appears. 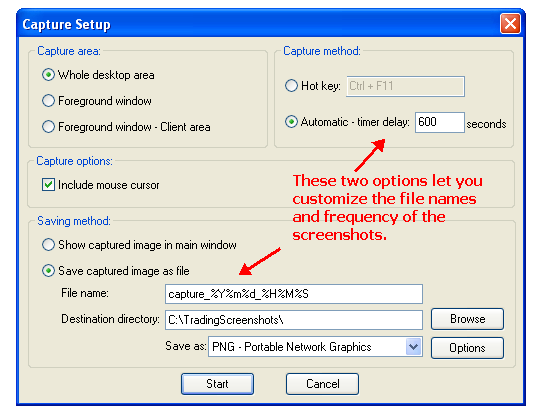 Select Automatic – timer delay for the capture method and specify the frequency of the screenshots in seconds. Depending on your time frame for trading, you’ll want to specify a frequency that captures enough screenshots, but not so many that it’s too overwhelming to go back and review. I use 5 minutes (300 seconds) which is suitable for my style of trading. 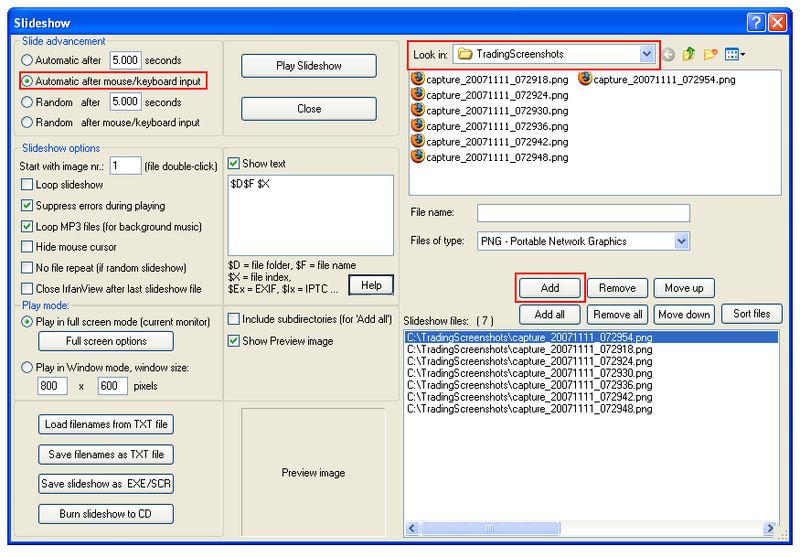 Under the Saving method section, choose Save captured image as file and specify the file name format and the destination directory where you’d like the image files stored. I’d suggest using the format “capture_%Y%m%d_%H%M%S” for the file names since sorting by the file name in Windows explorer will also sort them chronologically. IrfanView also comes with a nifty slideshow which is perfect for reviewing your screenshots. From the File menu, choose Slideshow and browse for your screenshots in the Look in section. In the Slide advancement section, choose Automatic after mouse/keyboard input then click Play Slideshow. You can use the left click mouse button to advance to the next screenshot and the right button to go back to the previous one. Hit the Escape key to exit the slideshow. While IrfanView is great for single monitor systems, using it on computers with multiple monitors will only capture the screen from the “primary” monitor, not your entire desktop. To capture your entire viewable desktop on a multiple monitor system you can use a program called Snagit from Techsmith. The current version of Snagit is $39.95 although previous versions are free. Snagit it is a great tool in itself for marking up and drawing on image files (great for taking notes on charts). Snagit does not come with a slideshow viewer, so even if you have multiple monitors you’ll still want to install IrfanView to view your screenshots. After capturing screenshots of my trading for just a short time, I discovered that the way I had organized my charts during the trading day prevented me from seeing certain opportunities and that I wasn’t utilizing all my screen space effectively. I came up with a strategy to improve the way I situate my charts and it’s given me more confidence knowing that I’ll find more profitable opportunities in the future.